A long-standing charitable organisation and an Alnwick school have joined forces to improve a well-used path, in a special centenary project that will ‘leave a mark for the next 100 years’. Alnwick Lions Club has joined forces with Swansfield Park Primary School to adopt and tidy the public walkway which runs beside the school, from The Avenue to Swansfield Park Road. The aim is to spruce-up the stretch, keeping it clear of leaves and mud that runs on to the path and makes the area dangerous in the autumn and winter months for the young children and their parents to walk on. There are also plans to provide more seating and plant new flowers. Tom Deedigan, member of Alnwick Lions, said: “Lions International has been serving all around the world for 100 years, as of June 7, 2017. “Alnwick Lions Club was formed in 1975 and currently has 26 members. As part of the Lions’ centenary celebrations we wanted to find a project that encompassed the Lions’ ethos of improving our community. “We also wanted a project that would leave a mark for the next 100 years, so, to that end, Alnwick Lions Club will be working with the children, parents and staff of Swansfield Park Primary School to adopt the public walkway and tidy the area. 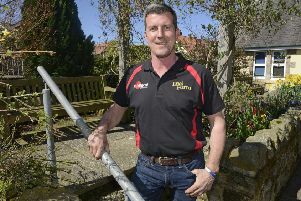 “Alnwick Lions Club wants to work with the pupils, parents, staff and other local organisations to make this area safer for the children and the wider community by improving the retaining wall and planting some new flowers, bushes and to provide more seats. Headteacher Jenny Smith praised the project. She said: “We are excited about working with the Alnwick Lions to improve the area around our school for the benefit of the wider community. “Our children have often voiced their concern about the state of the cut and we all welcome the opportunity to work on this project.